There are several different brands of nibs for dip pens. I use Speedball and Hunt pens, but there are other brands. There are also many different types of nibs. The ones I mention just happen to be the types I use most often. You may find other nibs more suited to your own style and preference. Hunt 100 (“Artist”): a very delicate and flexible nib. Its lines can be fairly reminiscent of brushwork. 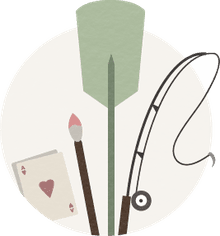 Hunt 102 (“Crow Quill”): stiffer, pencil-like action. Good for rapid sketching, crosshatching, etc. Calligraphy nibs: these have a built-in reservoir, usually made of brass. They hold more ink and give a very constant line. While they are intended for calligraphy, they can also be used for drawing. Different nibs provide different points and line widths. 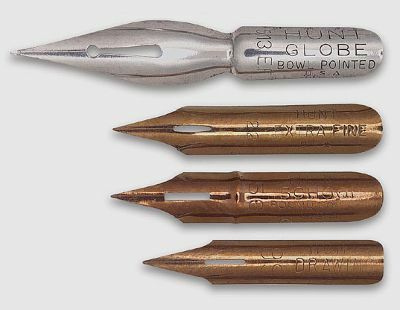 Speedball nibs come in square, round, flat, and oval points. Different nibs will also require different holders. Clean your nibs after every use to prevent clogging and rust. A good way to clean nibs is to “stab” them into dishwashing paste and then give them a good scrub with a stiff, old paintbrush. This does not work on calligraphy nibs, as the reservoir will get in the way—an alternate method would be to load the paintbrush with dishwashing paste and use it to scrub the nib. To prevent rust, gently wipe the nibs with a lint-free cloth and allow them to air-dry before storing. A good storage system for nibs is a plastic “tackle box” where different nibs can be kept separately. If the nib suddenly exhibits changes in ink flow (e.g. flow stops and starts, blots, etc. ), dried ink or fibers from the paper may be causing the problem. A thorough cleaning will usually solve the problem. If cleaning doesn’t help, examine the nib under a magnifying glass—the "tines" may have become bent out of shape, or may have separated. You can try to gently bend the pen back into shape with a pair of pliers, but it is usually better to throw the nib out and buy a new one. If rust is the problem then the nib will have to be discarded as well. Unlike India Ink, water-based (fountain pen) inks are easier to clean off nibs—they simply require a quick rinse under running water. This can be quite good when you’re in a hurry or just want to make a few practice runs, sketches, etc. They can also be used to create pen-and-wash by going over the inked work with a clean, wet brush. Use smooth, lint-free paper. Rough paper can damage the nibs, causing them to "catch" onto the surface (you will also end up with ink blots and splatters when this happens.) Lint can get caught between the tines. When drawing, the nib must be pulled across the surface of the paper—pushing the nib will cause it to dig into or catch on the surface. This will damage both the pen and paper and also cause ink to splatter and blot. Art gum and vinyl erasers are best for removing pencil lines on inked work. Art gums, in particular, will not damage the inked lines. Rough erasers and “ink erasers” are not recommended—they tend to damage the surface of the paper and make it more linty. White ink is good for covering mistakes made in black ink, or for lightening areas, improving contrast, etc. Lastly, do not be afraid to experiment. Nibs are fairly easy to use and very versatile. Varying the pressure, hold on the pen etc. produces very individual lines. Note: for those looking for good books on the subject, Rendering in Pen and Ink, by Arthur L. Guptill and The Pen & Ink Book, by Jos. A. Smith are both excellent references.